Val's Quilting Studio : Baby + Quilt = So Sweet! My daughter texted me this picture of our new little guy slumbering under his new quilt. She said the soft minky is nice and warm, perfect for Winter nap times. He's one month old already! 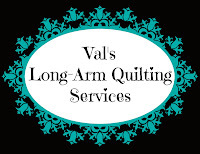 Just one of those "ultimate moments" we quilters cherish. I especially appreciate that she knew I wanted a picture of him with his quilt and that she always uses the quilts I make for them. Such a sweetie, Made me smile and feel all rosie inside. Oh, how tiny and adorable your Jack seems under his beautiful quilt. There is just something about sleeping babies. I love it!! He's so tiny and peaceful, snuggled under his own special quilt! Before you know it, he'll be dragging it around behind him everywhere :) What a beautiful little boy! Really sweet. I'm going to stay with my daughter and her new born baby boy this Christmas. Wishing you a Merry Christmas! So special! He's got lots of room to grow into that quilt. Perfect! So sweet!! 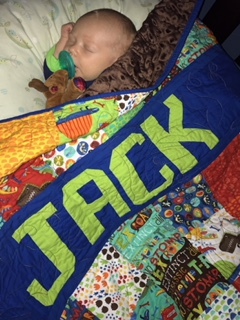 He will love that quilt for many years to come. So precious, the baby and the quilt. He looks like he knows his quilt was made with love!